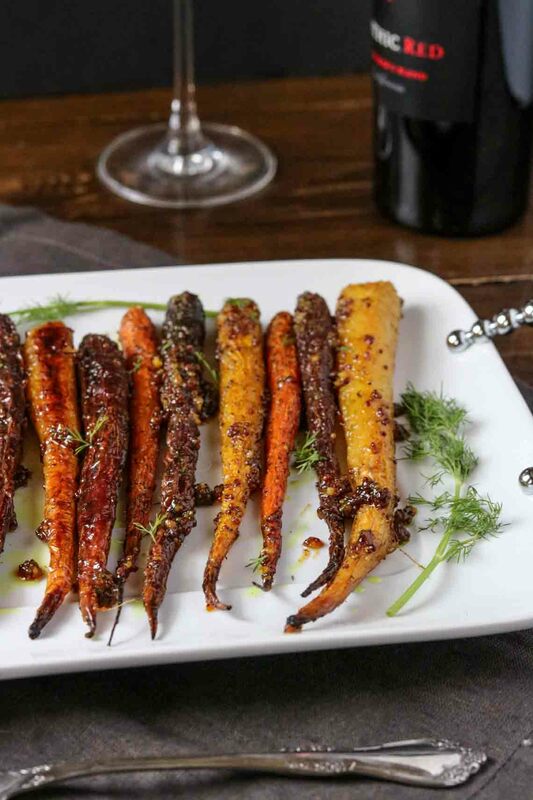 Day 2 of your Paleo Thanksgiving meal plan is a side dish that won’t disappoint, maple mustard roasted carrots. You can find these full sized rainbow carrots at most any grocery store that carries organic produce. Funny story, I picked a bunch up at Sprouts (my favorite local organic grocer) and it literally looked like I had a small tree in my basket with the amount of greens still on the top of these carrots. If you find yourself in that situation, your friendly produce man will gladly cut them off for you. I’ll remember that next time. Orange: Beta and alpha carotene pigment. This promotes vitamin A production by the body, which is essential for healthy eyes. Purple: Anthocyanin, beta and alpha carotene pigment. 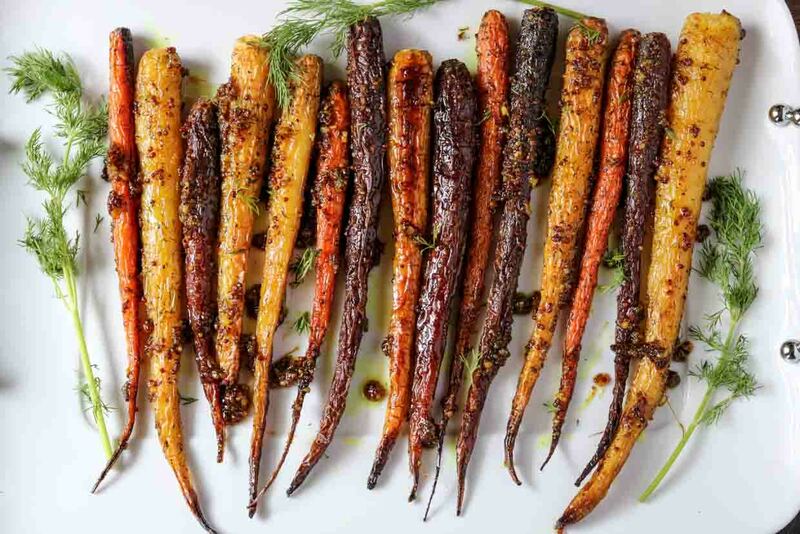 Purple carrots typically have an orange core, and their pigment-related nutrients may provide additional vitamin A and prevent heart disease. Red: Lycopene and beta-carotene pigment. Lycopene is the same red pigment that gives tomatoes their deep color and is linked to a lower risk of certain cancers, such as prostate cancer. Yellow: Xanthophykks and lutein. Both are linked to cancer prevention and better eye health. White: The nutrients don’t come from the pigment but from the fiber, which promotes healthy digestion. Let’s talk about the flavors in this recipe. The maple mustard glaze is both sweet, with a hint of tangy, and becomes a nice caramelized glaze when roasted. 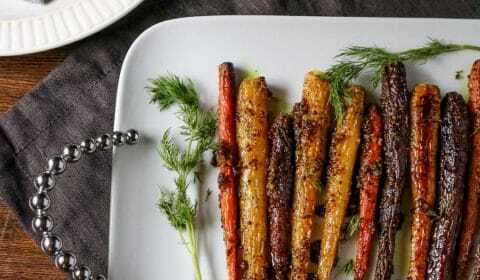 Then add a hint of dill and these maple mustard roasted carrots are probably one of my new favorite side dishes. 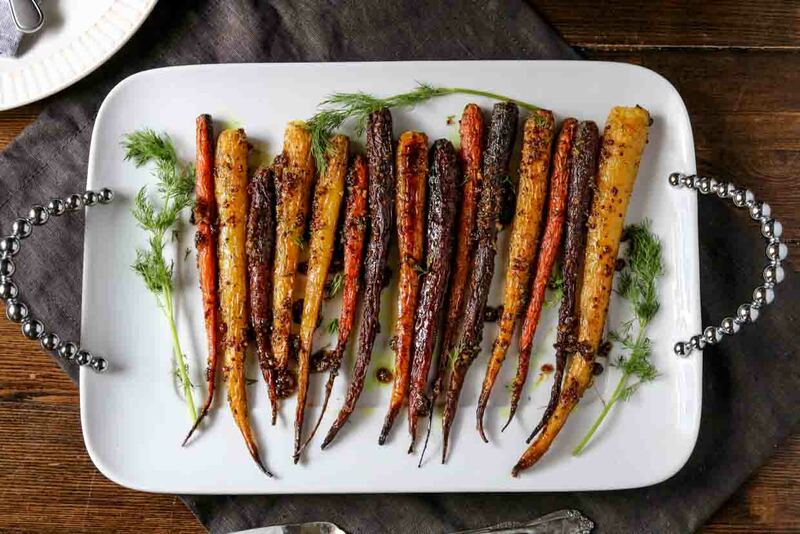 Skip the plain roasted carrots, or the carrots glazed in unhealthy brown sugar and give these a shot. I promise you they won’t disappoint! Cut the green tops off of the carrots but leave the skin on. Wash and pat dry. Lay flat on a lined baking sheet. Melt coconut oil, add in salt, pepper, and dill, mix to combine. Brush oil and seasoning mixture onto carrots coating heavily. While carrots are roasting, prepare glaze. Add all glaze ingredients to a small saucepan and heat on low, stirring occasionally. 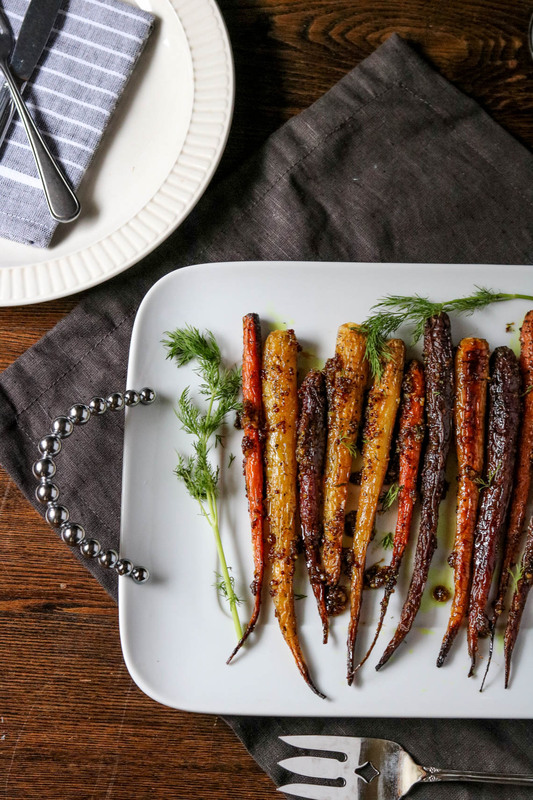 After 30 minutes, remove carrots from oven and brush glaze over carrots, coating heavily. Place back into the oven for an additional 10 minutes. Remove from oven, sprinkle with additional fresh, chopped dill weed and serve.